For lush, healthy growth and vibrant colors in your fresh or marine water aquarium. The Mitras® LX 7000 series is an ultra-bright LED full-spectrum light with an enormous power density (versions 7006/7206 with up to 195 W) that ensures natural brilliant colors (CRI> 95), uniform illumination, and radiant brightness in your aquarium. Equipped with the innovative GHL Power Balancing Technology®, the maximum power of LEDs can be divided into different color channels as needed. With its incomparably high photosynthetic efficiency, the Mitras® LX 7000 series is unique in the market. As with the Mitras® LX 6000 pendant lights, this is achieved by carefully assembled high-power LEDs. Developed and manufactured in Germany, the luminaire is characterized by the latest in LED technology and is incredibly efficient and durable. Compared to conventional lighting technology, the luminaire can save approx. 50% energy costs per year. Light is Not Just Light – read more about the Basics of Mitras® LED Illumination – Lumen, Lux, PAR and Photosynthesis – and why Mitras® LED Illumination the perfect choice is. The elegant Mitras® LX7 is designed to be used as pendant lights over open aquariums. The installation above the basin can easily be done with the stylish Mitras Flex Mount System or GHL Hanging Kit. 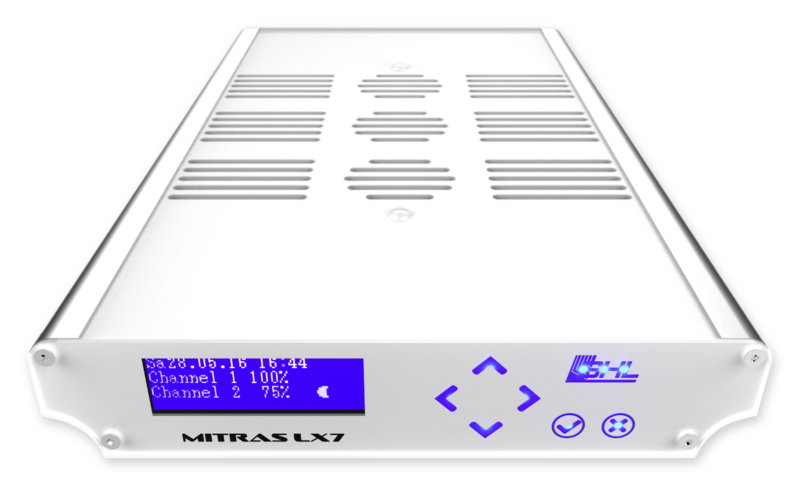 * Mitras LX7 may not be used in a closed aquarium below a cover. The clearance between aquarium and Mitras LX 7 must beat least 20 cm (7.9″). 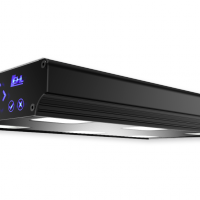 If you are looking for a lumious and powerful alternative for built-in or closed aquariums, we recommend our LED Light Bar Mitras Lightbar. Our first-class product design, technical know-how, and extremely careful selection and assembly of the LEDs ensure outstanding illumination performance. 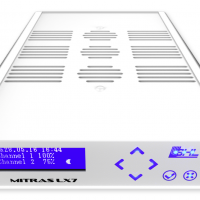 Mitras LX 7 provides the ideal light spectra for marine and freshwater aquariums. Our full-spectrum luminaire uniquely mixes light to provide plants and corals with high photosynthetic efficiency which promote the lush growth of plants and corals. 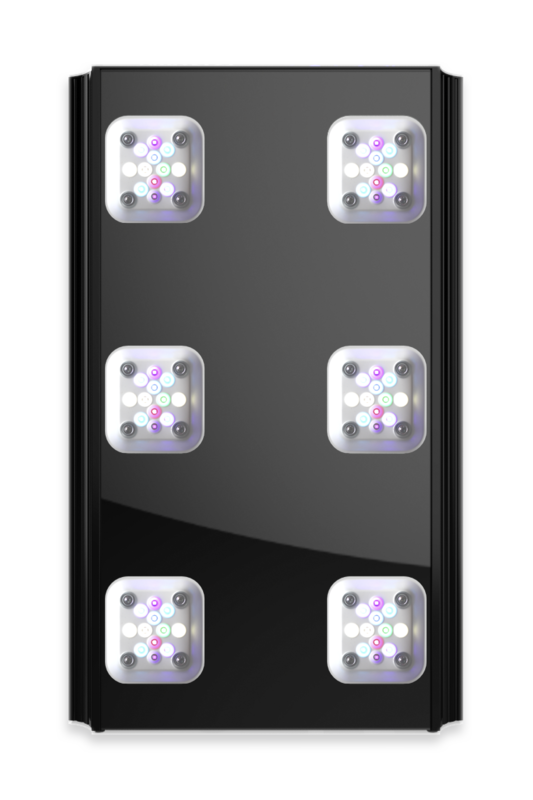 Interchangeable LED clusters with 72* high-power LEDs (min. 150 lumens / watt white LEDs) for optimum color mixing and uniform illumination. Our LEDs are operated at the highest efficiency and intentionally not operated at the maximum possible current. 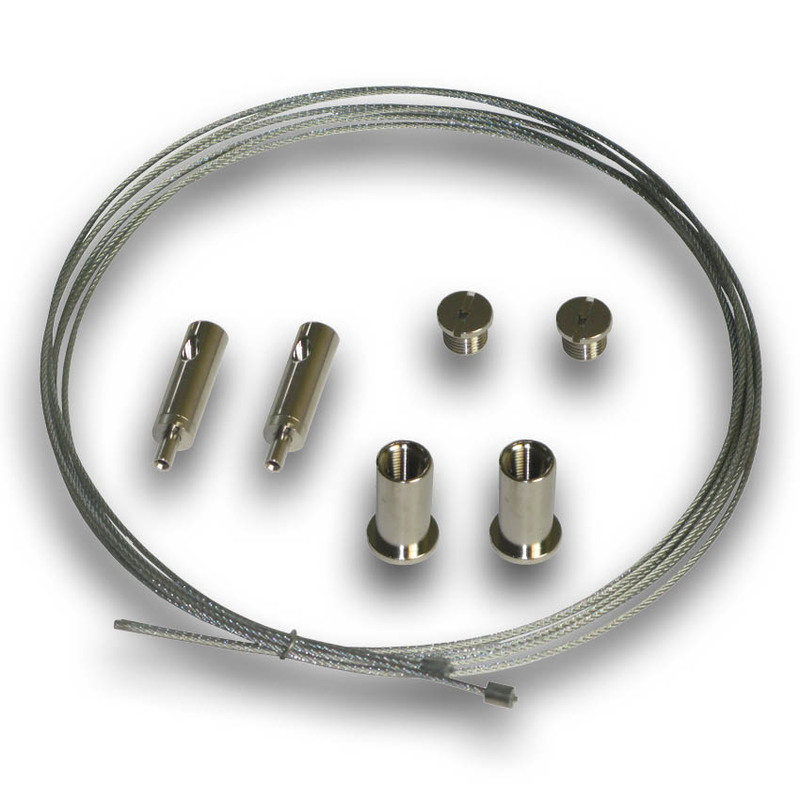 Operating at the max possible current significantly reduces the LED life and energy efficiency. 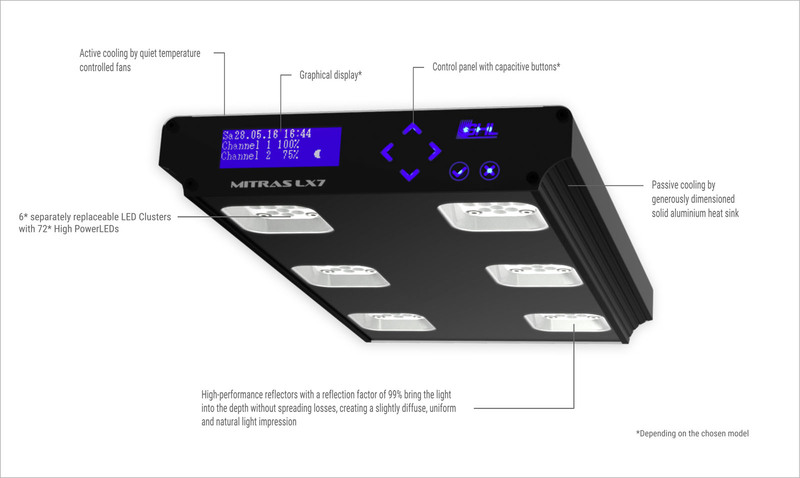 Mitras LX 7 incorporates a larger number of LEDs at reduced power and maximum efficiency. 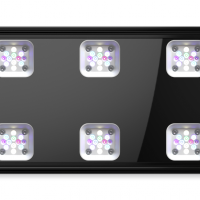 *For models with 6 LED clusters. 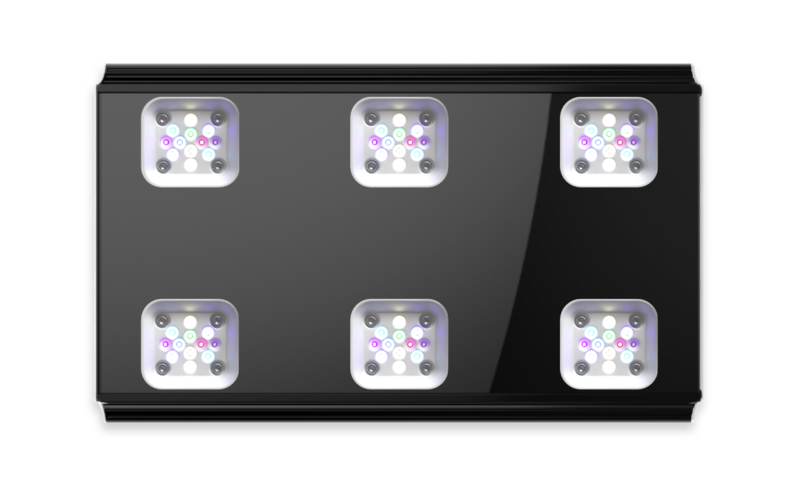 Instead of using LED lenses that cause light loss, we use special, metal-coated high-performance reflectors made from the same materials used for space technology to maximize light efficiency, increase light spread, optimally blend LED colors, and minimize light loss. Our reflector design mimics the reflective performance of Metal Halide reflectors and reflect 99% of light. This allows for maximum light output and significantly increased light penetration, even in depth. Evenly distributed light is as important as high light output. 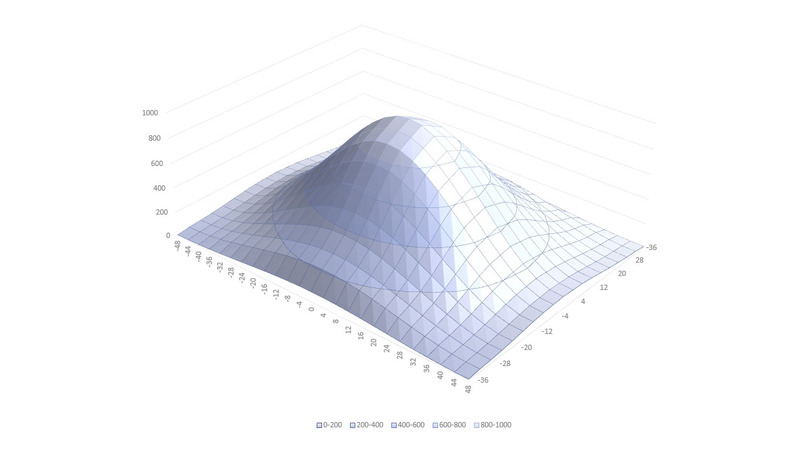 Through complex computer simulations and practical tests, we have determined the best possible placement of the LEDs and shape of the reflectors. 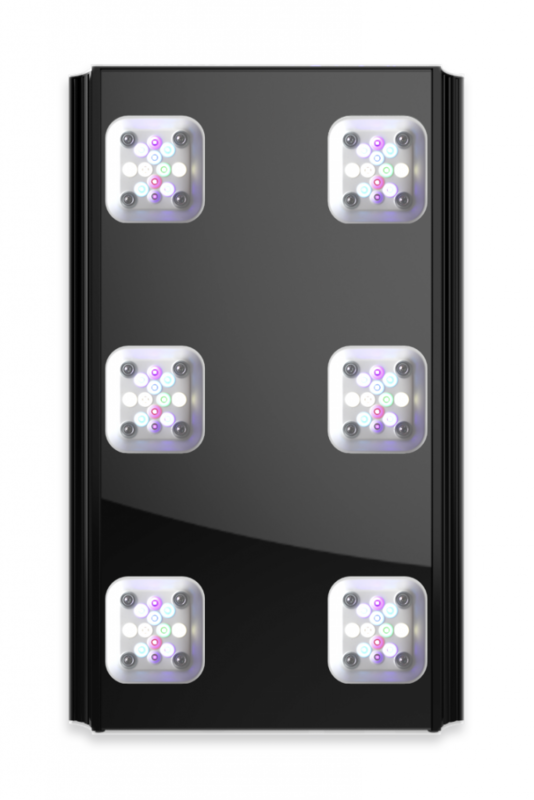 In order to ensure optimum illumination, the LEDs were arranged in 2 x 3 evenly distributed clusters. 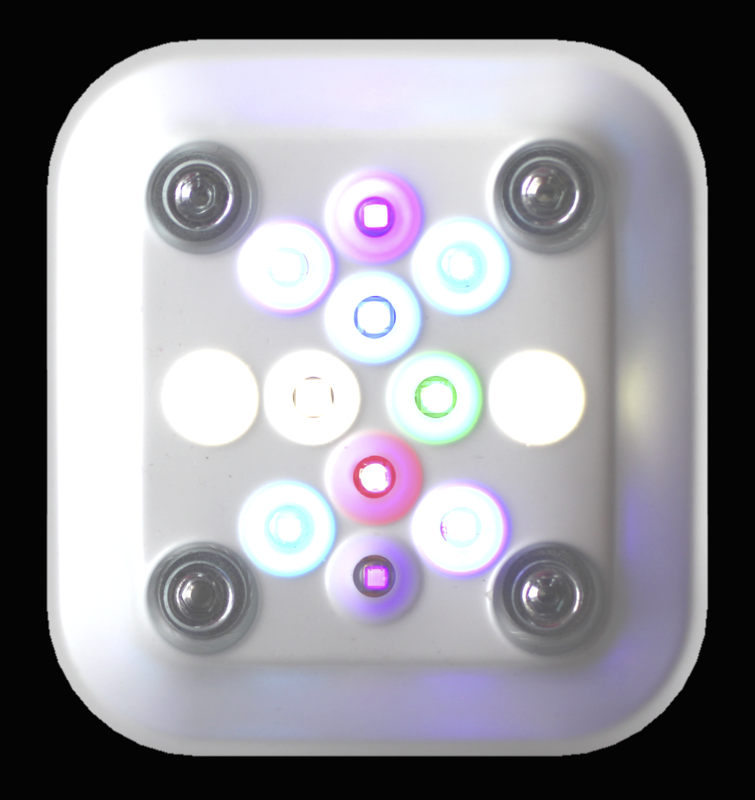 The LEDs in each cluster were then placed as closely as possible. Specially coated high performance reflectors additionally ensure a homogenous and natural light impression. The reflection factor of 99 % carries the light also into the depths, without unnecessary divergence losses of the light to the sides. The light is also reflected lightly diffuse from the reflectors. Due to that a homogeneous natural lighting effect is achieved, which is very important especially if different colores LEDs are mixed. 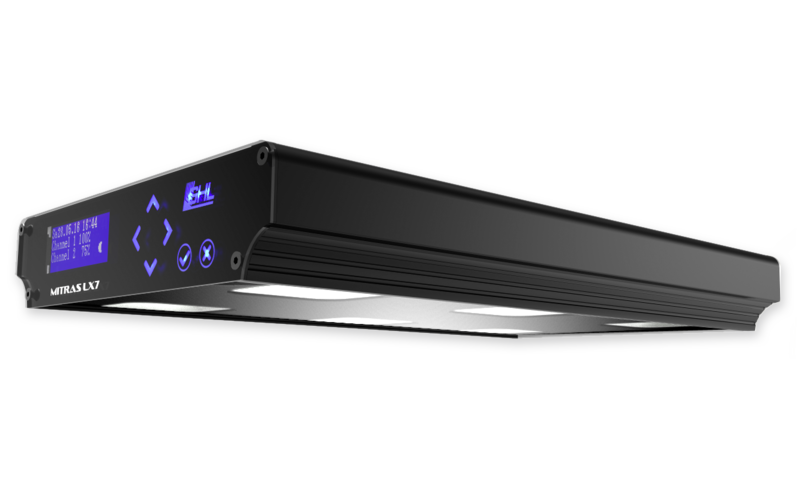 The innovative cooling system (active, passive, and controlled by a microprocessor) ensures reliable protection against overheating for maximum luminosity of LEDs and a particularly long service life (> 80,000 hours). Active cooling is accomplished by extremely quiet and powerful temperature-controlled fans. The speed of the fans are temperature-dependent and are automatically adjusted. Passive cooling is accomplished through a large solid aluminum heat sink with seawater resistant anodized aluminum coating in accordance with DIN 81249-1. Microprocessor-controlled automatic brightness reduction prevents the luminaire from overheating: If temperature continues to increase despite maximum cooling, i.e. due to increasing ambient temperatures, the brightness is reduced slowly and continuously until luminaire temperature goes back to normal. 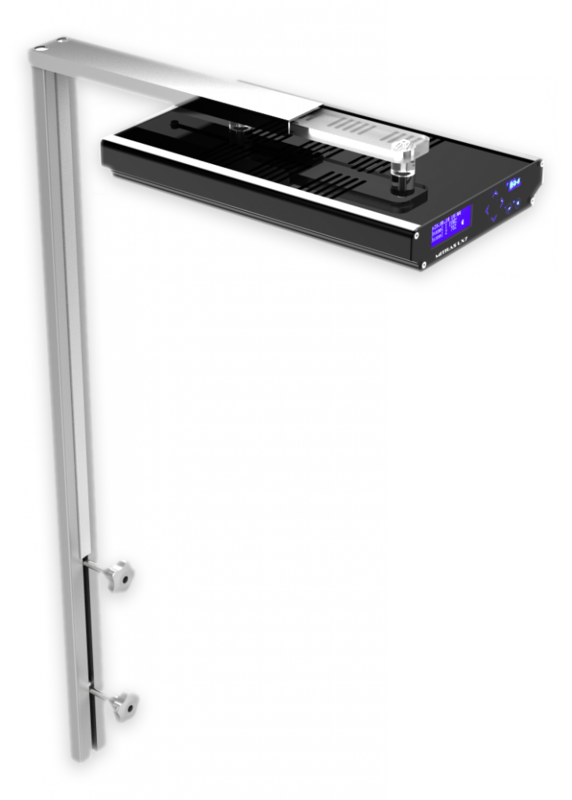 This system allows the electronics and the LEDs to always be operated under optimal conditions. With the integrated lighting control, you can conveniently adjust the light output as well as the light spectrum in a wide range exactly as needed and save it as an illumination project of your own. Very fine Dimming by GHL Perfect Dimming Technology® with over 4000 dimming levels and a dimming ratio of 3000: 1 per light channel (color). 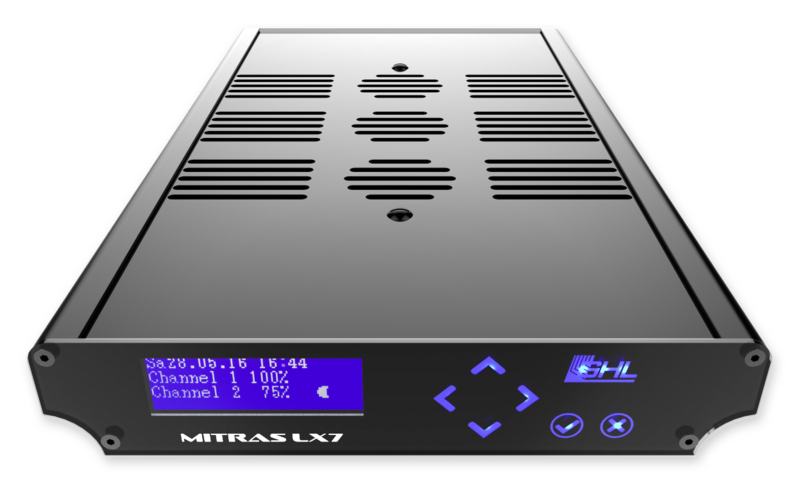 The professional and free PC operating software GHL Control Center (GCC) allows you to conveniently operate and configure your Mitras® LX7 with the PC. With GCC, you can easily create your desired illumination program. 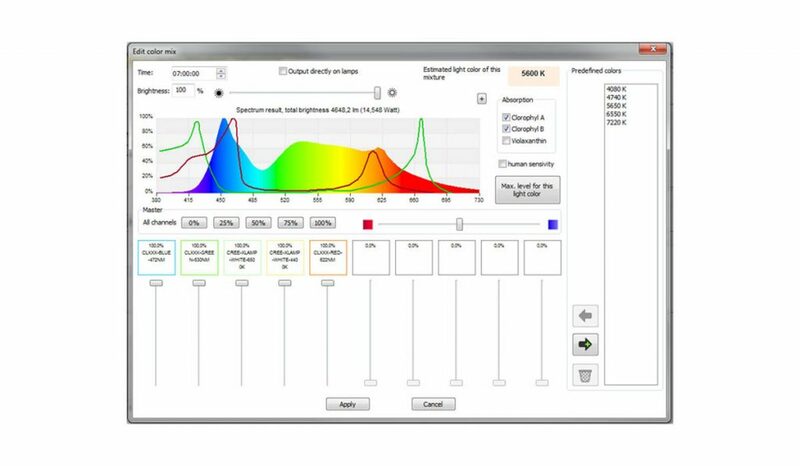 Light color and illumination intensity can be programmed to vary over the course of the day. You can either just take over one of the existing lighting projects for your luminaire, or create your own project from scratch. A diverse selection of connectivity options are at your fingertips. 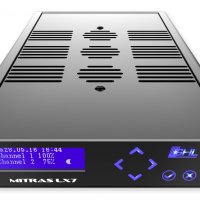 Operate the LX 7 directly from the device’s control panel, via PC, or cloud (myGHL). The operation of the luminaire (also as master/slave) is simple and user-friendly. The graphical display gives you a quick overview of the current operating conditions of the luminaire. The control panel of the luminaire and its back-lit capacitive buttons offer quick and easy operation. Tasks such as changing settings or starting special effects such as thunderstorm simulation can be accomplished from the graphic display. To control Mitras through a ProfiLux controller, the ProfiLux Wireless Interface (PLM PWC Expansioncard) is required (not included with Mitras LX). 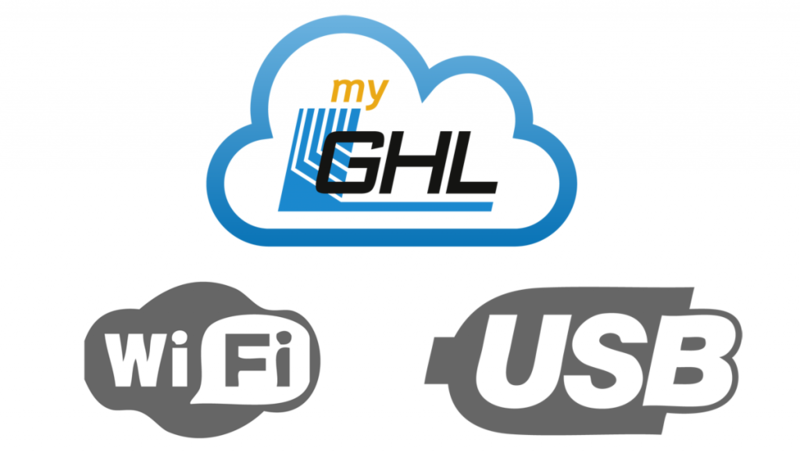 Connect the Mitras LX via the cloud (myGHL), your smartphone, or your computer – built-in WiFi and USB offers you all the connection options you need. For communication betweeen multiple Mitras LX (e.g. in Master/Slave-mode), the Mitras LX includes a second RF module which works independently from WiFi. Potential home network problems will not affect the Mitras LX, neither will the internal Mitras LX traffic stress the network. Fast 32 Bit ARM-microcontroller with enough power reserve for future software extensions. Average color temperature will depend on LX 7 type; each type is fine tuned for specific applications. All Mitras Luminaires are designed with upgradeability in mind. Each type of Mitras can be equipped with any matching LED-cluster type (mixing LX 6 and LX 7 clusters are not possible). This type of technology gives you the flexibility to swap LED clusters and benefit from the latest technological developments. For example, an LX 7000 can be converted to an LX 7200 with a simple cluster swap. All Mitras LX models are equipped with the necessary hardware to support different LED-cluster-types; a firmware update may be required. With GHL Control Center, new cluster configurations can be easily activated. Unlike many other LED fixtures, Mitras LX lamps do not create an unsightly and disturbing “disco effect”. This effect is often noted as seeing obvious color spots on the substrate which tend to move side-to-side during water surface agitation. Our metal coated high performance LED reflector mimics the reflective performance of parabolic Metal Halide reflectors by perfectly blending all LED channels. In a single Mitras LX cluster, all 12 LEDs are housed on an area of just 25 mm x 25 mm – this narrow arrangement and special reflector design helps achieve perfect light mixing. Dimensions (L x W x H) 324 mm x 200 mm x 42 mm / 12.8" x 7.9" x 1.65" 245 mm x 68 mm x 40 mm / 9.6" x 2.7" x 1.6"
Dimensions (L x W x H) 212 mm x 200 mm x 42 mm / 8.4" x 7.9" x 1.65" 222 mm x 68 mm x 39 mm / 8.7" x 2.7" x 1.5"
* Above specifications relate to average parameters and may vary due to component tolerances and ambient conditions. * Both the power supply and luminaire become warm during normal operation and must therefore be installed in an area that allows for sufficient heat dissipation. The Mitras Flex Mount System combines maximum stability and flexibility in a simple, yet stylish aluminum frame. 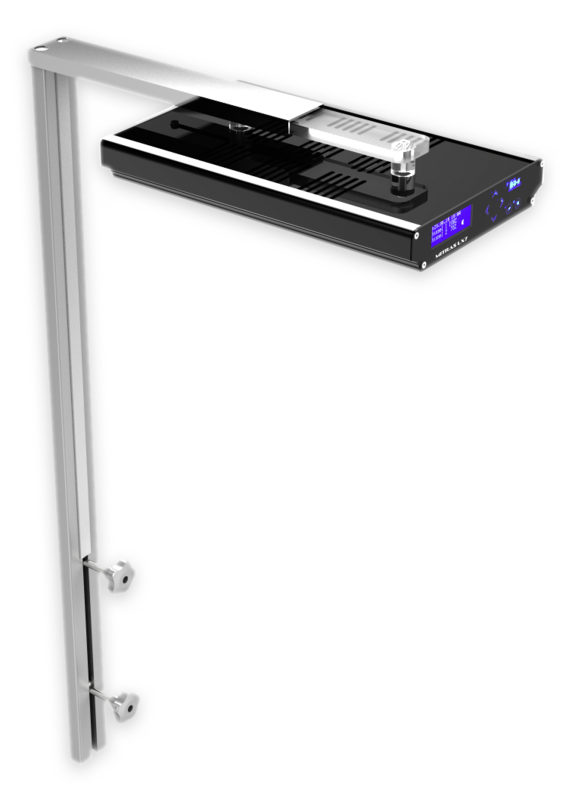 The high-quality fastening system is made of aluminum, stainless steel, and acrylic glass and features adjustable height and depth options. Mitras Flex Mount is also compatible with the Mitras LX 6 series. The Mitras® LX can be hung with a patented high quality Hanging Kit, that consists of ceiling mounts, hanging wire, wire holders and mounting brackets. This Hanging Kit enables flexible height adjustment of the lights over the basin and is available online in our shop GHL Store.